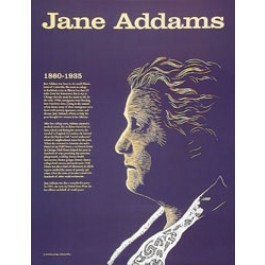 This educational poster of social reformer Jane Addams features a striking artist's illustration of her, as well as biographical text detailing her life and accomplishments. In 1889, Jane Addams co-founded Chicago's Hull House, America's first settlement house, providing hundreds of services to poor people. 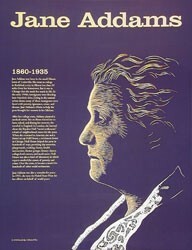 In 1931, Addams became the first American woman to win the Nobel Peace Prize.